They seem to be popping up everywhere and are very popular. I'd be claustrophobic! Could you live in one? I have seen the television programs on these things and am curious how these people plan to live in these things. In some cases there are families of 3, 4 or even 5 crammed into something smaller than a tomato crate. Topping that off they were previously living in a large house where the living room or kitchen was bigger than what they are attempting to move into. Not particularly something I could handle and considering I live in a New York City apartment that says a great deal. When they give the square footage on the 'house' they are building or moving into, I am weirded out by the tininess of the places as they are smaller than what I live in. Our 2000 square foot house has a 300 square cottage in the back yard which wife and I lived in for about 6 months, while we rented out the big house. It was ok, because we had a 1300 square foot double wide about 45 miles south, which was quite rural. We lived in the rural home most weekends and holidays. We gave the rural house and 3.3 acres to our daughter about a year before we had to file bankruptcy as our drug addicted tenant trashed the place. Our 2000 square foot house is now cluttered with 3 adults and two dogs, and the cottage is filled mostly with stuff we should throw out. Some of us want to be a smaller foot print on planet Earth, but it did not work for wife and I. That is a pretty one. Not counting homes I lived in with my parents as a child, I've rented or owned some neat places over the years - a tack on first small apartment, a good apartment that was a whole floor over a spanish style house, two small rooms in an artists' building with a bathroom down a common area hallway, a big studio, a couple of early 1900's California bungalows (one small, one fairly large), and now about a 1000 sq ft POS half of a duplex. Poor judgement on this last one, as I was in a hurry to not keep staying at my friends' house, which was kind of them to let me stay at in the first place. I liked all those other places and have a fair eye on housing as a landscape architect but boy, was I stupid on this last one. So? at this point I'd like the house in that photo! I'd have to give it some bookshelves.. Temporary basic shelter for someone in a tight stretch in life. Not a new concept - travel trailers were used back some decades ago. This might work in Calf. or Florida, but not in Michigan. Being able to use those big outside porches is the key. I just downsized to 1004 sq ft from 2025. Why can´t they work in Michigan? You put glass around one of the porches and you have one more room and a nice place for cooler evenings. Given how little of my house I use, I could probably do it. I've lived happily in some pretty small apartments over the years. As long as I had good access to the outdoors and a nice porch, I'd be pretty happy. The little dog would probably like it as there's no way I could hide from her. It would certainly be incentive to clear out a lot of crap from my life. I was surprised at how little space it takes to live. My brother, I and our wives lived in TED ( temporary emergency domicile) a 20 foot travel trailer for 6 weeks at a time while building what we thought was a tiny vacation shack (900 sq ft). TED living was actually fun and it felt like moving into a mansion when the shack was done. A yard long enough to land a small plane is a necessity though. I live in a large house and I seem to use every corner of it. My summercabin is small but seems big as there are large windows in every direction and air, space and the ocean. i think its nice, gives you a very cozy ambiance. Could be our future someday when the world is filled with more and more people. But I vote for very large houses at any day. I'd have to have enough room to turn around in when I change my mind. 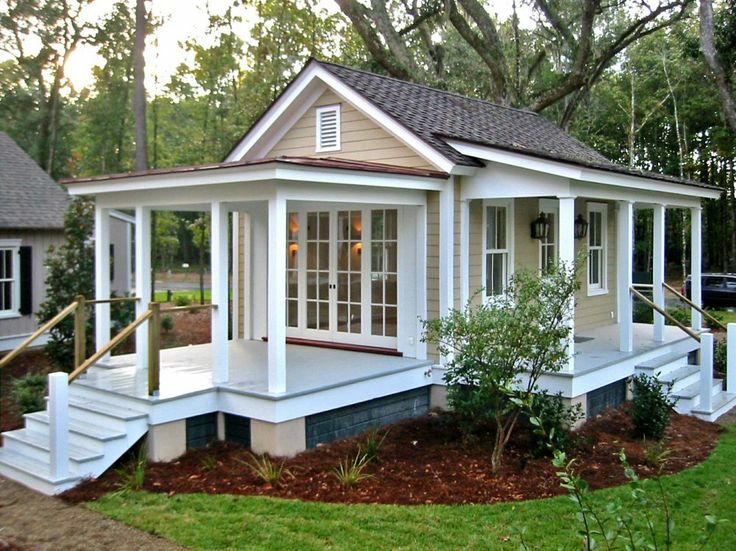 » What's up with all these tiny houses?